Remember the days when buffalo roamed the streets of Hot Springs? You should – it was just last year! Six buffalo escaped their farm in 2015 and led the city on a 26-day chase before they were captured. So what do we do to commemorate the great escape? Throw a street party, of course! 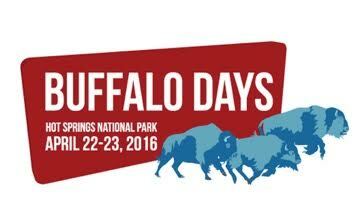 The inaugural Buffalo Days Festival will be held April 22-23, 2016, in downtown Hot Springs. nationally syndicated radio host (and Hot Springs native) Bobby Bones and the Raging Idiots. Special guests will include Uncle Kracker, Lauren Alaina, Mo Pitney, and Arkansas’ own Barrett Baber. The concert will be held in the Bank of the Ozarks Arena at the Hot Springs Convention Center at 7p.m. Tickets can be purchased at Ticketmaster or the Arena box office. Saturday events will be held at Baxter Plaza behind the Arena. A food truck row will be set up for food and drinks, there will be a beard and mustache contest, Native American dancers will perform, as well as entertainment by Dixie Jade and the Shelby Lee Lowe Band. The Inaugural Running of the Buffalo will be held later in the afternoon. The one-mile run will race through the streets of downtown Hot Springs, and end at Baxter Plaza. When the last runner reaches the plaza, Dances with Buffalo will begin, featuring music by Al Paris and the Heartbreakers. As we’ve said before, Hot Springs is famous for quirky, fun festivals, and Buffalo Days promises to be another “don’t miss” event! Consider making Tiffany’s Bed and Breakfast your home base for the weekend to add a little peace and quiet to your weekend of fun!